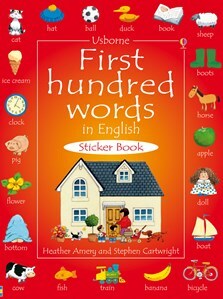 The classic Usborne sticker word book, with busy scenes illustrated with warmth and humour by Stephen Cartwright. Each scene is accompanied by labelled stickers of objects to talk about, search for and match together. An exciting talk-about book for the very young, a stimulating picture word book for pre-readers and a lively source of ideas and spellings for first writers. Also useful for learning English, and students can listen to all the words read by a native British speaker at the Usborne Quicklinks Website.